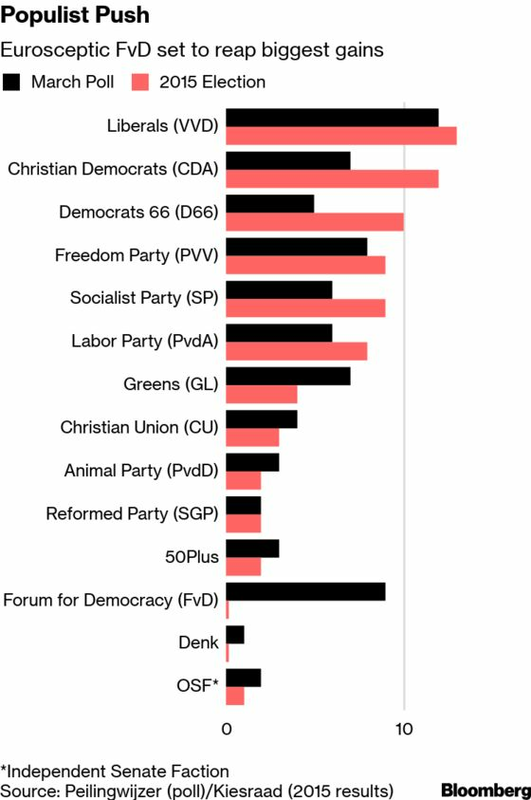 (Bloomberg) -- The bulwark that Dutch Prime Minister Mark Rutte built against populists is showing cracks, with his governing coalition poised to lose its one-seat majority in the Senate in the face of expected strong showings from euroskeptic groups. When the Dutch go to the polls on Wednesday, Rutte’s four-party coalition -- comprised of his liberal VVD, the Christian democratic CDA, the centrist D66 and the smaller Christian Union -- may win just 28 seats in the 75-member Senate, down from 38, according to a Peilingwijzer aggregate poll published on Tuesday evening. The vote in one of the European Union’s six founding members can be seen as both a report card for Rutte’s government and a gauge of populist sentiment in the bloc. The anti-EU Forum for Democracy is set to post the largest gains, which could make it harder for Rutte to follow through on his policy agenda at a time the EU is pushing to reassert its strength in a turbulent global environment that’s seen transatlantic relations on the rocks. Voters across the Netherlands will be casting their ballots in provincial elections, which dictate the make-up of the upper house. Polls close at 9 p.m. and a first indication of seating in the Senate is expected after midnight. At the last general election two years ago, centrist Dutch parties beat back a push by Geert Wilders’s populist Freedom Party. And while the anti-Islam, anti-migration group still managed to become the second-largest party in the lower house, it was blocked from coalition talks because mainstream politicians refused to work with them. The latest poll suggests CDA and D66 are set to lose the most seats among the four coalition parties, with Rutte’s VVD remaining the largest in the Senate, according to Tom Louwerse of the University of Leiden, who compiles the Peilingwijzer poll. The Greens are set to gain three seats for a total of seven. The Freedom Party is expected to win eight seats, a loss of one, the poll data show. But more troubling for mainstream groups are indications that the Forum for Democracy, which entered the lower house in 2017 and is led by Thierry Baudet, is estimated to gain nine seats in the Senate. Forum, which says it’s inspired by Italy’s anti-establishment Five Star Movement, shares some views with Wilders, such as on leaving the EU and stricter migration rules. Baudet also claims that his party is the only one that advocates a drastic revision of the Dutch political system, aiming to break what they call the “party cartel” of those in charge. Even though Wednesday’s is a provincial election, national issues hijacked the campaign, with a debate on the distribution of costs between corporations and citizens linked to targeted cuts in CO2 emissions dominating discussions. The Dutch government aims to lower emissions by 49 percent in 2030, a goal the country will be unlikely to reach, according to a government research institute. In response, Rutte said that measures would be announced in April, including steps to lower taxes on consumers’ energy bills and a “sensible’’ CO2 levy on companies. Such policy items may help Rutte’s coalition win support in the Senate of new partners, such as the Greens, which they’ll need to push through legislation if their majority is lost. 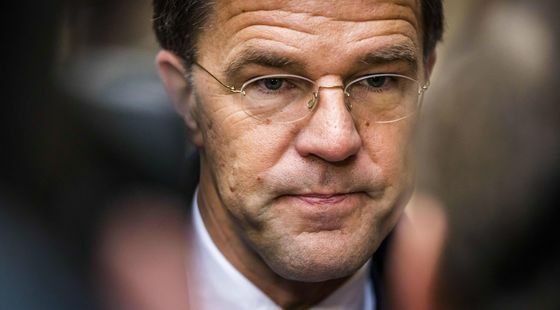 And Rutte needs all the friends he can get now, because if a general election were held now, his VVD party could lose as many as nine seats in the lower house, according to a Peilingwijzer poll from February.